Darren Higgs, with some thoughts on hard work versus talent. 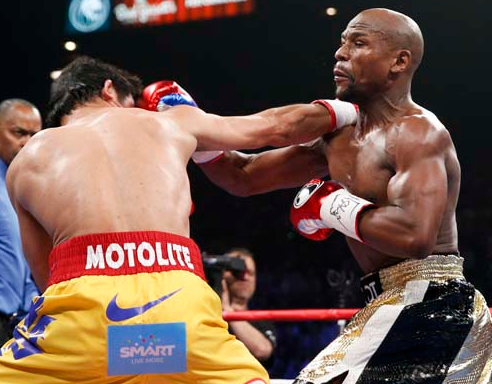 I have just finished watching the “Fight of the Century” between Floyd Mayweather Jr and Manny Pacquaio. Regardless of what people thought of the bout, you had two great martial artists who have worked very hard on their game and developed tremendous skill. They also have great natural talent and genetics, as proven by their speed, power and durability. It got me thinking about what is more important, hard work or talent? I always lean towards the hard work. I have never been naturally talented. From a martial arts sense, I have never been overly fast, strong, flexible, etc. However, I have been willing to do the work to improve my technique and skills. This is what I credit towards achieving my 4th Dan Black Belt (with no intention of stopping there), fighting in and winning overseas tournaments, as well as running martial arts dojos with my good mate and a terrific bunch of students and mentors. I acknowledge that it is a lot easier to do the work when you love what you do. I cannot think of a better way of working out. However, you still have to face those times when it is hard, or you are tired, or you are frustrated, or you are getting the worse of it in sparring. That can be deflating. At times like that, you just have get back into fighting stance and keep doing the hard work until you get better. I know that other people favour natural talent over hard work. Granted, there have been some people since the dawn of time that have a “genetic edge”. They make things look easy and can do things that others cannot. I also know that I will never run 100 metres in under 10 seconds, no matter how hard I work. So you must give credit where it is due with “natural talent”. We mentioned that a natural talent with a good work ethic is a pretty formidable opponent. It is not an impossible opponent, though. How do you counter this? With “Strategy”. Developing good strategies will often see you prevail. For example, be equally good on your left and right hand side. Have moves that fit your knack, such as basic kicks, punches, clinches, wrestling and grappling moves that complement your strengths. These will be your reliable “go to“ moves in a self defence situation….your “talented” moves, if you will. Learn how to remain calm in any situation, as the calm mind can think and react better. How do you develop strategies to counter any situation? Through consistent training and experience. You must put in the hours so you know what works for you. The beauty about martial arts is that it suits everybody, whether you are female, male, big, small, young, old, timid, not-so-timid, athletic, non-athletic, yada yada yada. There are always things you can do to better yourself and to improve your chances in a self defence situation. Set realistic aims, add a lot of discipline and let your instructors help you with a well designed training program / syllabus. This will allow you to excel in your “Fight of the Century”, no matter how naturally talented you are. We are always interested in your thoughts. What do you think is better – hard work or natural talent?